There are many voices critiquing the North American church today. The voices come from both within and without; from those who love the church and those who hate it. We all know that there is something wrong. But what? In many cases the prescription is the same while the cure varies widely. In his new book Crazy Love, first-time author Francis Chan, pastor of Cornerstone Church in Simi Valley, California, regular speaker at Passion conferences and other events, and the guy who recorded that “Just Stop and Think” evangelistic video where he walks for miles holding a surfboard, takes his opportunity to challenge the church. “This book,” he says, “is written for those who want more Jesus. It is for those who are bored with what American Christianity offers. It is for those who don’t want to plateau, who would rather die before their convictions do.” It is a book that is meant to change the way Christians live their lives. There are two ways of critiquing the church. We can critique out of love or out of disgust. Chan is committed to critiquing the church as an act of love. In a recent interview, when asked about the emergent church, he said this: “As a pastor I hear a lot of emergent leaders talk about what is wrong with the church. It comes across as someone who doesn’t love the church. I’m a pastor first and foremost, and I’m trying to offer a solution or a model of what church should look like. I’m going back to scripture and seeing what the church was in its simplest form and trying to recreate that in my own church. I’m not coming up with anything new. I’m calling people to go back to the way it was. I’m not bashing the church. I’m loving it.” And his love for the church is obvious throughout this book. 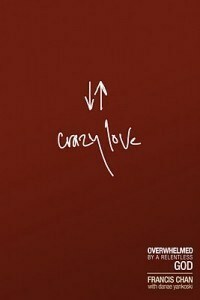 The format of Crazy Love is straightforward and effective. Chan dedicates three chapters to renewing our understanding of the character of God and seven chapters calling Christians to examine themselves. Within the book are two ongoing themes that are going to get people talking. The first theme is that we must painstakingly examine ourselves. We cannot assume we are saved, or to use the biblical metaphor, we cannot assume that we are the good soil. Chan calls the reader to a serious self-inventory through a chapter that provides a profile of the lukewarm. He concludes, “a lukewarm Christian is an oxymoron; there’s no such thing. To put it plainly, churchgoers who are ‘lukewarm’ are not Christians. We will not see them in heaven.” God wants all or nothing. These two themes and a focus on the Scriptures serve to create a powerful and deeply challenging book. There is a very obvious commitment here to teach Scriptural principles from the Scriptures and to invite the reader to verify what he is writing from those same Scriptures. Not surprisingly, the book’s weakest chapter is the one that depends least on the Bible. It is a chapter providing examples of men and women who have made radical choices to live radically different. At least a couple of examples are of people who are probably not the best examples overall because as they’ve jettisoned their old lives, they’ve also jettisoned too much good theology. That small critique aside, I found that this is a paradigm-shaking book with a message that Christians desperately need to hear. Too many of us are living too safely and too easily. But for the brief moments we spend at church each week, we are practically indistinguishable from the unbelievers around us. This is not the way it is meant to be. The church could use a loving exhortation and Chan delivers well.